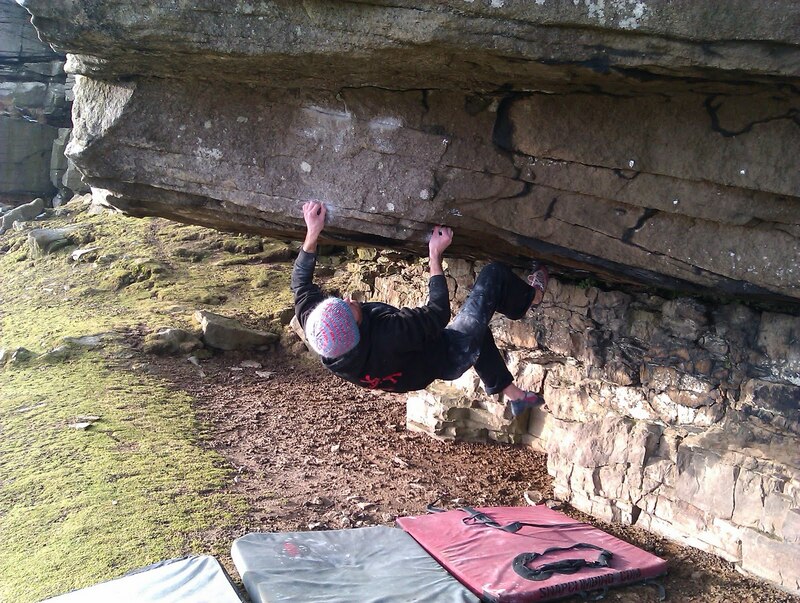 Skinny Dog's Esoteric Bouldering Guide. 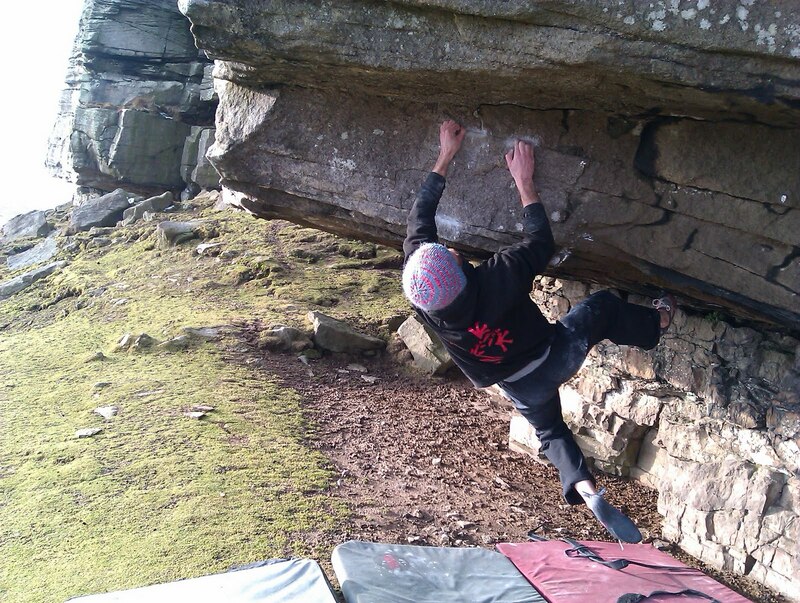 : Goldsborough – Esoteric Bouldering: Obsession and the move. 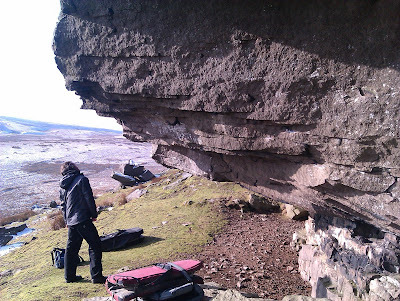 Goldsborough – Esoteric Bouldering: Obsession and the move. In quiet moments I quite often consider the nature and expression of sanity, and look at myself to see if these conditions really apply to me. I usually come to the conclusion that I am sane, just a little too enthusiastic about life (others would disagree). However when I explain to my work colleagues that I spend one of my weekend days in temperatures of minus three clawing my way up boulders with numb, injured fingers- they usually pronounce me utterly mad. Consequently I don’t dare tell them about climbing in Welsh caves through winter nights, in a state of sensory deprivation save for the flicker and splutter of a gas lamp. I’m sure questions would be asked, concerned phone calls made, and the relevant authorities would come and pick me up for an extended holiday on full board in a nice, white room. Liverpool is both a fantastic and frustrating place for a boulderer to call home. Our local urban sandstone crags are an acquired taste. Some hate its eliminate or uber-technical nature whilst others revel in its’ graffiti clad, litter-strewn majesty. I know of one very notable local beast who claimed he would not take the opportunity to move to the ecstasy of a lifetime of world class sports climbs in Catalonia until he had floated up Monobloc at Pex Hill; testament indeed to the draw of the lines and the history that surrounds the climbing in Merseyside. Liverpool is perfectly situated for bouldering in Northern Britain; an equal distance from the Pass, Peak Grit, the Lakes and Yorkshire Grit. Everything is an hour and a half away, and herein lies the frustration. Three hours round trip with only a hunch about conditions!! Even with the advent of super-fast mobile means of communication, the picture of potential friction and moisture is never particularly clear. 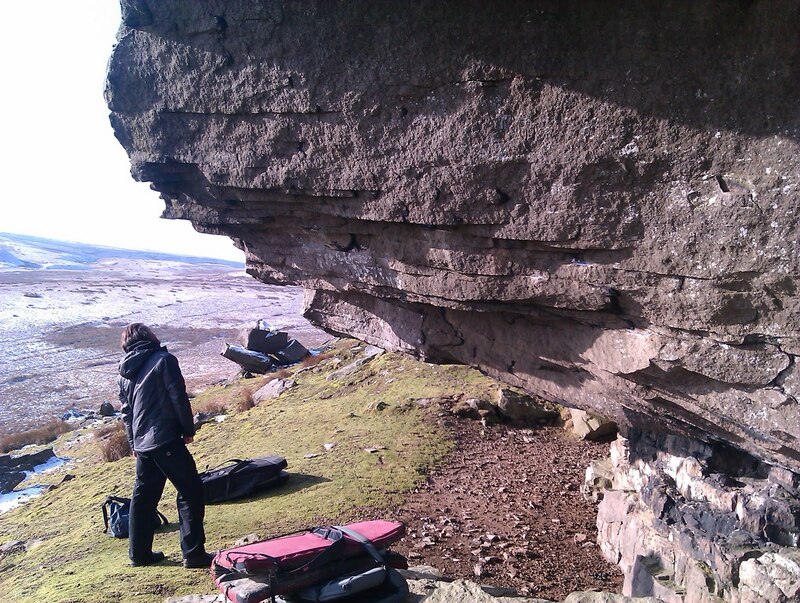 Being surrounded by a ring fence of Britain’s best bouldering there is often little incentive to discover the new and exciting. It is easier to languish in the established, the familiar and the classic. However life needs to be exciting and the path of the lazy boulderer, climbing the same old crumbling eroded problems is a negative one that ultimately leads to disillusionment and retirement. I have always been drawn to esoteria! Out of the way venues, with quality lines talked about in hushed tones; illuminating the climbing experience with bright flashes of personal discovery. All of this done in a natural arena with no crowds, no fanfare- just friends. I often muse on what makes a venue esoteric? Is it its popularity, its location, or climbing style? I just can’t put my finger on it. If I could I would bottle these elements and sprinkle them over all of our bouldering venues, thus improving everyone’s climbing experience. Goldsborough Carr is definitely one of these magic, esoteric venues. It sits high on rolling moorland, on the last gasp of the North Eastern Pennines, overlooking Barnard Castle and its surrounding hamlets. The drive from the A66 to the car parking seems to take you further and further from civilisation to a remoteness barely tangible in other parts of England. The crag inhabits a hill and sits solid and squat in a landscape that is reminiscent of Mediterranean table land, but with a lush greenness that only British precipitation can bring. These flat topped vistas permeated by curvaceous valleys are characterised by one overriding sense, and that is of silence, deep brooding silence that is strangely comforting when compared to the hustle and bustle of urban living. The fact that Goldsborough has earned its esoteric status mystifies me, this place should be popular. 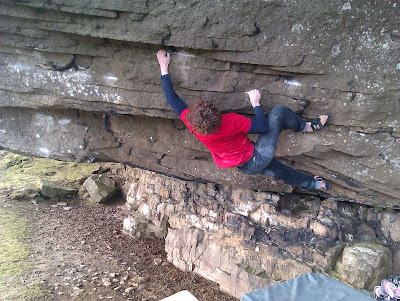 A quick search on climbonline.com (the font of North Eastern climbing knowledge) reveals the fact the Goldsborough has 158 routes and boulder problems. A more detailed search uncovers a PDF topo written by Steve Dunning (one of the main protagonists in this area), the topo is not comprehensive yet it still lists 12 problems of 7a and above, 9 of which are above 7c. Such a high concentration of difficulty is usually associated to the mainstream, not the margins. However as the lichen on the upper walls of these huge roofs stands testament, Goldsborough is very rarely crowded. You are more likely to be entertained by the sing song of a local accent saying “Hello,” as it meanders its way along the coast to coast walk (which traces the valley bottom) than be accosted by the aggressive grunts of someone trying to send! Goldsborough’s esoteric qualities can be attributed to its relative geographical position. 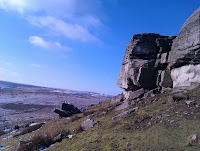 County Durham, the region within which Goldsborough is found, is sandwiched between the sculpted lines of Northumberland, and the rough brooding slopers of Yorkshire grit. 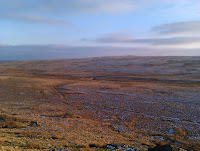 Goldsborough is reminiscent of both of these neighbouring regions in line and texture, but loses out to both of them. This ‘poor cousin’ status that Co Durham climbing has taken on may be its salvation in time. The lines at Goldsborough seem to fit into two categories; firstly good old fashioned highballs, problems that actually get route grades (a mixed economy promoted by the invention of the crash pad). The second category is that of the steep roof- these generally finish up the highballs and thus require some stamina. These roofs are characterised by big moves, small holds and an exercise in ‘horizontalism’ that some may consider an art form in its own right. To my mind three lines are worthy of particular attention. First is Jumping Jack Flash, a 6a+ that apes its way along and up the arête of Fiddlers Buttress. Next is Beth’s Traverse a 7b+ that scratches along crimps that trace a line through the steepness, joining Jumping Jack Flash at possibly its best move. The third line brings my thoughts full circle back to the subject of obsession. The die is cast, a project mentality is initiated and the commitment to days of travelling and failure is made. However this is not a negative occurrence. Giving in to this obsessive behaviour is what project based climbing is all about. In some ways having a project boiling away under the surface of my general climbing life makes me happy. 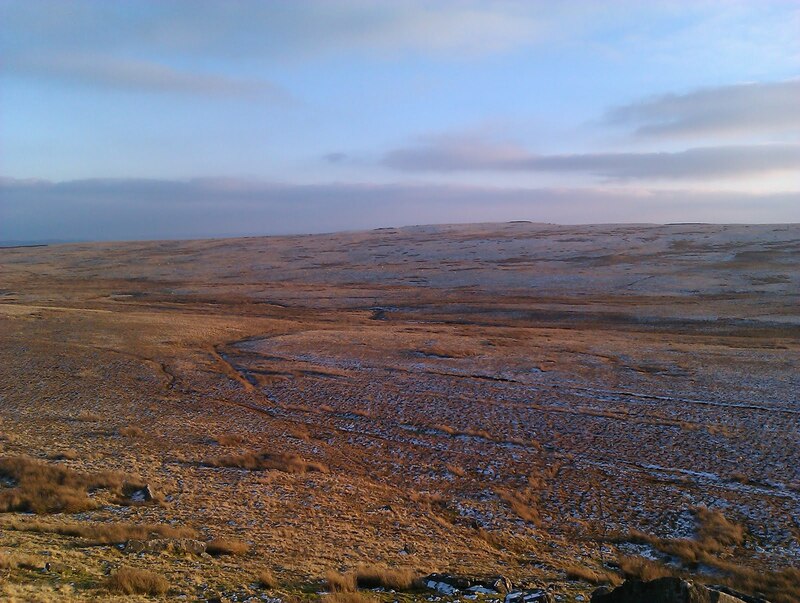 Where better to display such obsession than in the serene silence of the North Eastern Pennines. 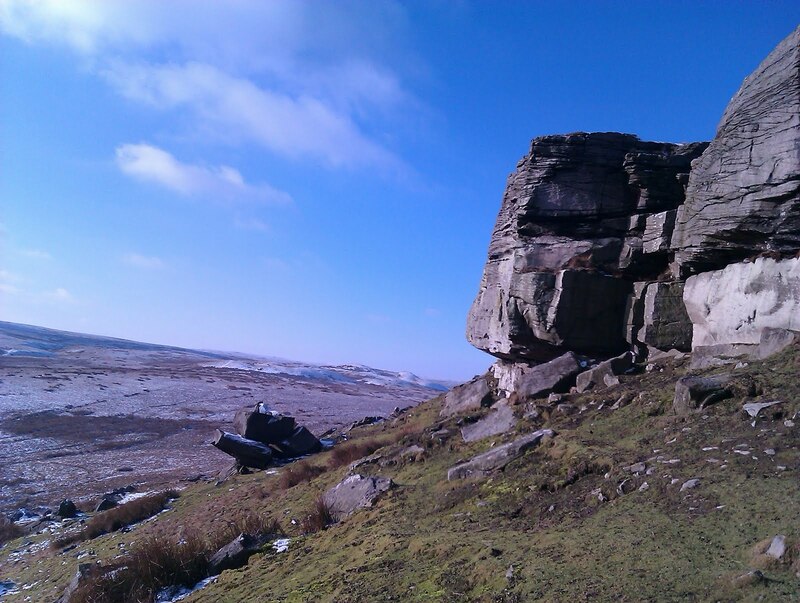 Goldsborough is great, its esoteric status makes it much better. No one else will be there; they will be in Yorkshire and Northumberland, leaving me to my rather guilty, manic, mad yet satisfying project. Goldsborough Bouldering from Owen McShane on Vimeo.